Roberta Levy has been a real estate professional in the Greater Lafayette Area since 1987. 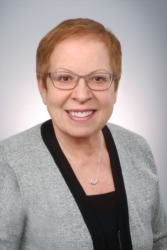 After attending Hunter College of the City University of New York, Roberta has continued her education through numerous real estate seminars and courses. She has studied Residential Appraisal, Relocation and Computer Applications for the Residential Realtor and has earned the Certified Residential Specialist (CRS) and Accredited Buyer Representative (ABR) designations.She has served as a Director of the Lafayette Regional Association of Realtors from 1997 to 2013. A Top Sales Producer for F.C. Tucker/Lafayette REALTORS® every year since 1991, Roberta has received many awards for production and performance. She is in the top five percent of all residential Realtors nationally and is a Life Member of the FC Tucker President's Club. In 2005 she was awarded the Professional Standards Award by the Lafayette Regional Association of Realtors. She was recognized as the top sales producer in the Lafayette Regional Association of Realtors in 2007 and was Realtor of the Year in 2008. Call Roberta Levy today at F.C. Tucker/Lafayette REALTORS® at 448-4884.